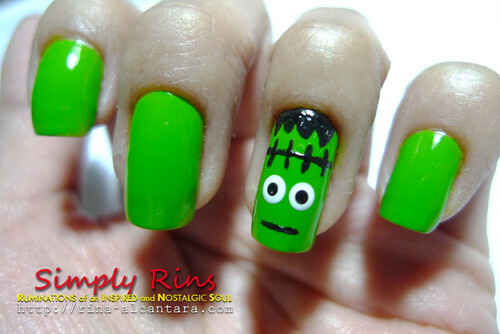 My Halloween project to create spooky nail art for the whole month of October will not be complete without painting Frankenstein on my nails! This is the 5th installment for my project. I've been doodling on how it will look and finally, I've decided on a simple design. Frankenstein and the chains that bound him on the table. I remember watching the 1994 movie Frankenstein that starred Robert de Niro as Frankenstein. The movie was based on a novel by Mary Shelley. The story of Frankenstein is about a man named Victor Frankenstein who tried to play god by using science to create life. He was successful in his experiment and his creation eventually was named after him. Nice green shade, eh? This is 2 coats of Elianto Apple Green. Application of first coating was streaky but the second layer easily evened out the consistency. I first did my accent nail, where Frankenstein is. Random triangles for the hair and added stitches in the forehead. I used a dotting tool for the eyes and just drew a straight line for the mouth. Don't worry about the uneven polish when you paint designs on your nails. It will be smooth after applying a top coat. Frankenstein on my right hand. I added chains on the other nails using an image from Bundle Monstem BM12 template. These are the chains that were used to secure Frankenstein on the table before he came to life! Haha! I used the black Konad special polish for stamping. Problem is, it takes forever to dry and so applying a top coat becomes very tricky. As you can see, I've smudged a few nails. I tried using a regular black polish on my pinky and it turned out okay and I didn't have any smudging problem. I'll probably be using the latter on future stamping.